Sinuses are located inside the skull. They occupy hollow spaces filled with air. At times, when the membrane lining your nasal passageways is damaged, the sinuses can become infected and create a condition called sinus pressure. This is when the sinus passages swell up and block the natural path of the air and mucus. Sinus pressure may also be accompanied by pain, and the condition is then called sinusitis. There are various causes of sinus pressure, all of which can be treated using the method of sinus pressure points. Bringing relief to sinus pressure as soon as it starts can be helpful as it prevents the condition from worsening and becoming sinusitis. 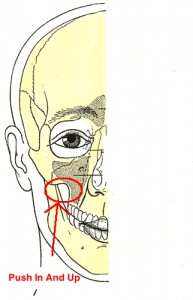 There are various pressure points on the face, all of which are known for alleviating sinus pressure. Find out where these sinus pressure points are and how you can apply the right amount of pressure to them. You can do one of two things: tap the point or press it for about two minutes. You can use any of your fingers. This helps the mucus to run out instead of drying up and creating infection in the sinuses. This pressure point can also help alleviate the discomfort brought about by a cold. Next, use your index fingers to press both points firmly and at the same time. Your fingers should be at right angles to the point in question. This is particularly effective for any pain behind the cheeks. Keep pressing for a minute at a time, in order to allow the sinuses to drain out without getting dried up and getting inflamed. Using this pressure point also helps prevent respiratory illnesses. 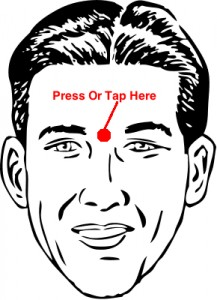 Once you have successfully located these two pressure points, use your two index fingers to apply gentle pressure. You must press in and then motion upwards. Pressing this pressure point for up to five minutes is strongly advised, because this is where the pain associated with sinuses is centered. The pressure behind your eyes will be eased as a result, and applying pressure to these points will also help wake you up by taking the pressure away from the eyes. It is a groove right above the upper lip, and to activate this pressure point, you can simply press in and then upwards at the base of your nose. This pressure point is particularly useful when you feel that a sneeze is about to come or that you are about to have an allergic reaction. Applying pressure on this point is also a quick and effective remedy for sinuses that are dried up, as it allows the sinuses to drain out and relive the pressure that is built up. 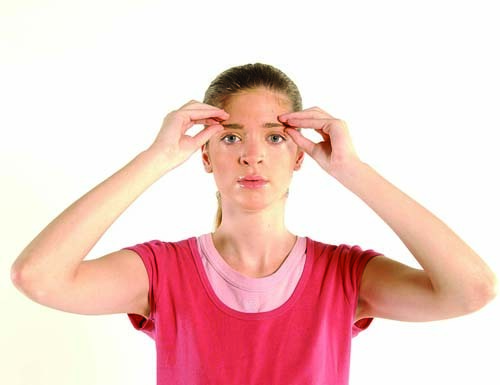 At times, you may experience the buildup of pressure behind your eyes and along the area covered by your eyebrows. To treat this pressure point, simply locate the ridge of your eyebrows, and then trace it with your thumb, while applying a gentle pressure onto the point. Start from the inner ridge and then move outwards on each side. Repeat for about two minutes and you will begin feeling relief from the pain and the pressure that has been built up as a result of your sinus infections. As shown in the photograph, use your thumbs to reach the sides behind your ears and trace the outline of your skull. Once you are at the base of your skull, use your thumbs to move in gentle circular motions, while applying some pressure to the points. Repeat this process every day to relieve cold, headache, and blocked nose. There are also other ways of relieving the pain and symptoms besides massaging sinus pressure points. These include the taking of medicines such as decongestants, as well as over the counter products such as a saline nasal spray, a neti-pot to flush out the mucus and irritants from the nasal passage. If the sinus pressure is caused by allergies, consider using antihistamines. You can also apply a warm compress to the areas of your face where the most pressure develops. You can simply soak a small towel in warm water and then place it gently on your face for thirty seconds. Make sure you drink lots of fluids to prevent the sinuses from drying up, and try sleeping in an upright position by propping yourself against multiple pillows. You can also make sure the air around you is not dry, by using a humidifier in your room, getting a houseplant, and even by spraying water on your curtain. If your symptoms persist for more than a week, make sure you see a doctor so that you can receive adequate treatment for your symptoms. There can be various causes of sinus pressure, and they vary by person. Most common causes include some foods, allergic reactions to certain environmental conditions including but not limited to dust, animals, smog, pollen, chemicals, viruses, and smoke. Other causes include cold and flu, and infection in the sinus membranes.